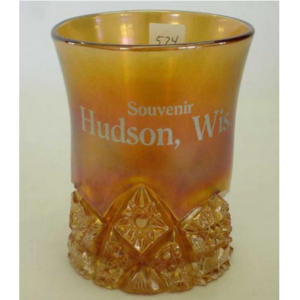 Pattern Description: Tumbler,creamer and mug (#2658)-geometric pattern of hobstars cover the lower third; whiskey decanter (#2666)has rounded bottom, narrow body with vertical rows of hobstars alternating with a cane pattern. 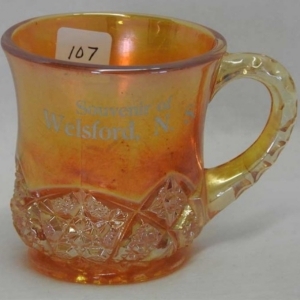 Cambridge had a line (Near Cut was actually a trademark they used) that mimicked cut glass patterns. The different pieces in the line were given pattern numbers only – collectors have given many of the unique pieces names that seem to fit. Buzz Saw, Wheat Sheaf and Near Cut are the three names used for different shapes/pieces in this line. 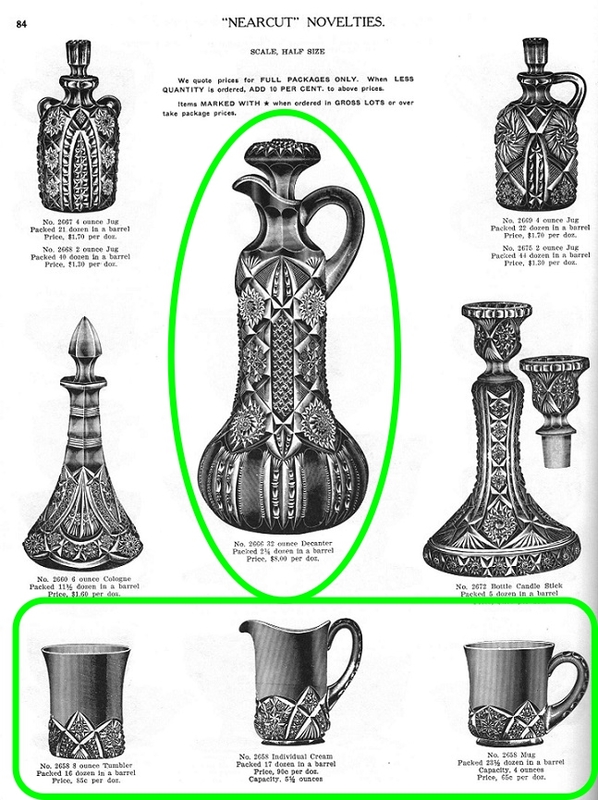 The pieces called Near Cut by carnival collectors are the Creamer/Tumbler/Mug (pattern #2658), usually in marigold. 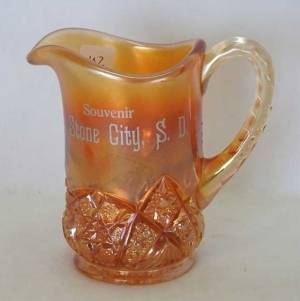 They frequently have stenciled souvenir information on them. These Nearcut-Novelties1 are shown in the Cambridge catalog page. The creamer, mug and tumbler are small pieces compared to the 12″ decanter! The Decanter (pattern #2666) is exceptionally scarce and was a blown piece of carnival glass that has a rough pontil on the base. The piece was stuck onto a punty (a long metal tool) used to hold it while it was being molded and iridized; when finished, it was broken off, leaving this pontil mark. You can see the similar Wheat Sheaf Cambridge-pontil here (thanks to Christina Katsikas for the photos of the pontils). These patterns are found in a very limited number of colors. The whiskey decanter is only reported in green. The pattern itself on the creamer, mug and tumbler consists of an 2 arches with a pendant shaped hobstar at the top and a small triangle below containing a fan shape alternating with a shorter hexagon hobstar. On the elegant and stately decanter the pattern consists of vertical alternating sections containing hobstars or a cane type filler. The bulbous bottom has concave ovals separated by pairs of what looks almost like a beaded strand.They definitely look very much like the cut glass patterns of the era. There are many similar looking ‘near cut’ type geometric patterns. 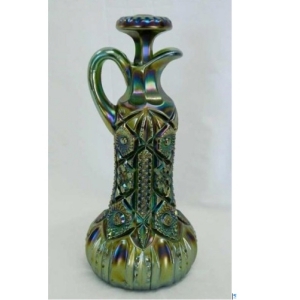 Imperial Glass company made a tremendous amount of geometric patterns as did US Glass. The unique shape of the whiskey decanter will help you identify this pattern for that shape. And the only other whiskey decanter with a geometric pattern is the Cambridge Wheat Sheaf (which has a different shape with a straight body).